Posted January 14, 2012 in 2012/01, Publications, Topic, z Archive. Titan has announced the next two volumes for the Simon and Kirby Library as has been reported in Comic Book Resources. One of them, Horror, had been previously announced and is now scheduled for release in 2013. The book scheduled for the fall of 2012 is Science Fiction. Because the material in this volume was so dear to Joe Simon he held it back and it was not part of the original agreement with Titan. However recent events had caused those plans to be altered. 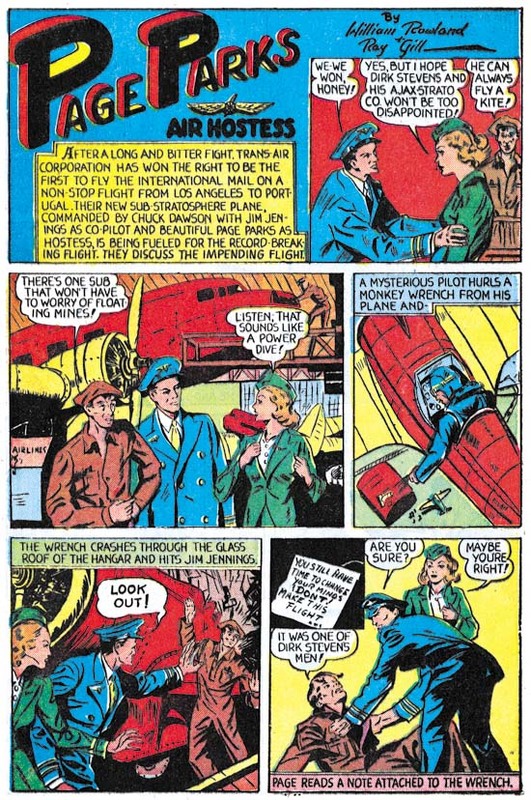 As I wrote above, the Simon and Kirby science fiction was very important to Joe. 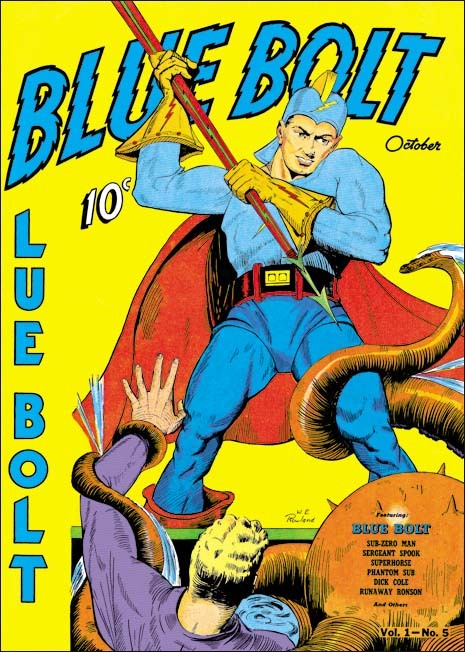 One of Joe’s earliest creations and the first that can be described as a real hit was Blue Bolt. 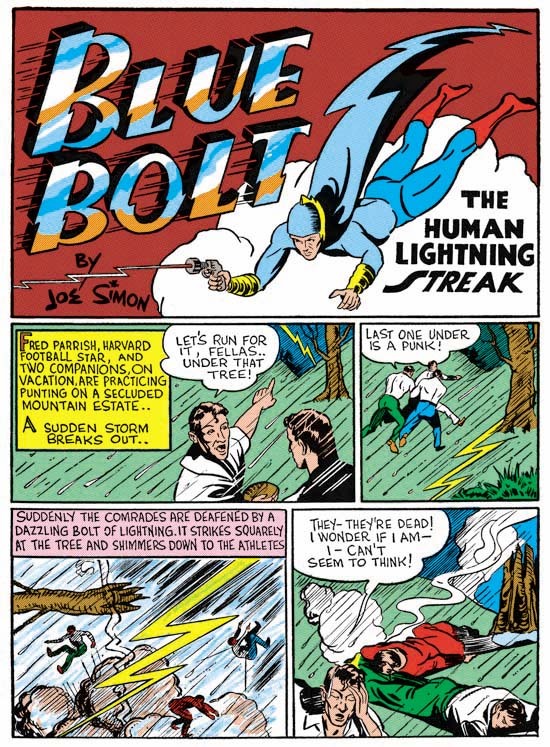 It was while working on Blue Bolt that the Simon and Kirby collaboration took root. 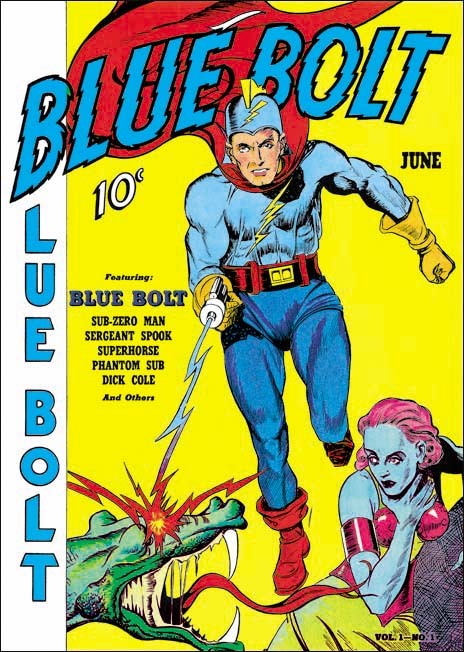 Most of the initial Blue Bolt stories had been previously reprinted some years ago in a small trade back. Considering the state of the art at the time it was a valiant effort but by today’s standards somewhat flawed. But the most puzzling thing about this earlier reprint was that it failed to include the origin story from the first issue. I am happy to write that the Titan volume will include first story and that all the stories have been fully restored. 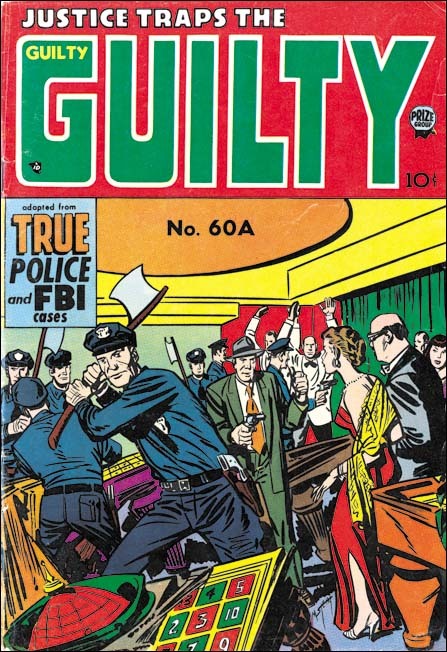 If you have seen the Crime volume from the Simon and Kirby Library you know what to expect. 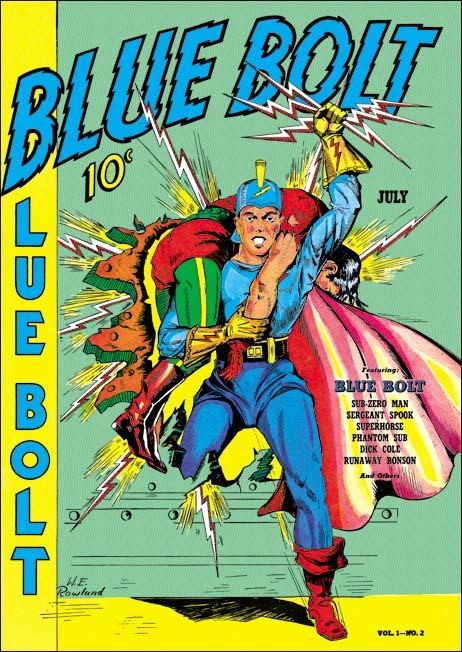 I showed Joe the Blue Bolt restorations a few weeks before his passing and he was quite pleased. Who was the best Kirby inker is a much debated issue. I would say that nobody was better inking Kirby than Kirby himself closely followed by Joe Simon. But putting those two titans aside who did the best job inking Kirby? 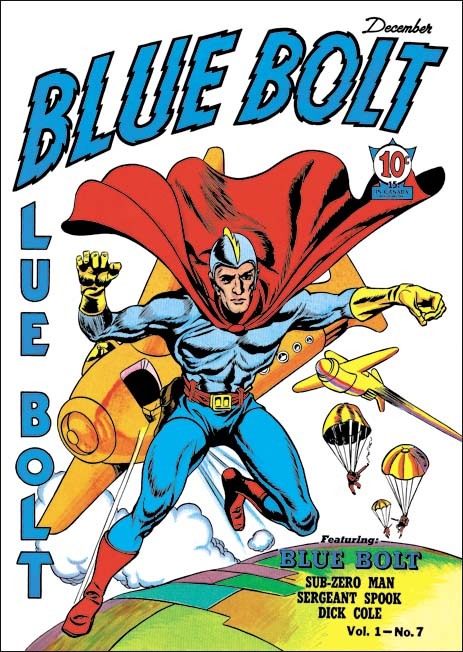 Of course most fans would probably chose some silver or bronze age inker. But I would say the best Kirby inking work appeared in Race for the Moon published in 1958. In his recent autobiography, “My Life In Comics”, Joe says this was the joint effort of Reed Crandall, Angelo Torres and Al Williamson. 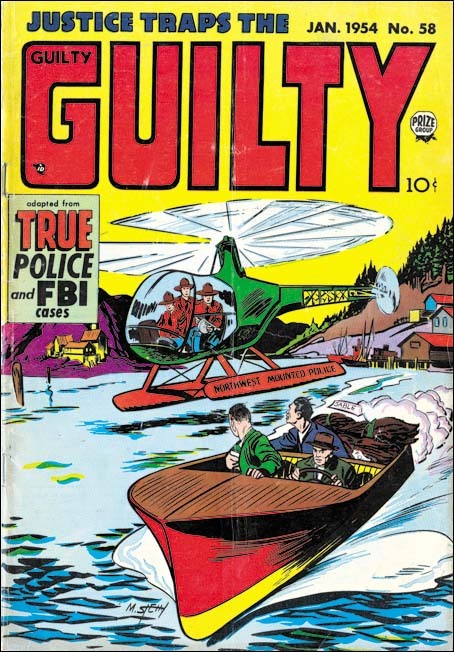 It was a beautiful job but one that did not live up to its full potential due to the notorious poor printing of Harvey Comics. Fortunately all of the Race for the Moon material will be restored in the Titan volume using either original art or flats (production proofs of the line art, the next best thing to original art). Altogether the Science Fiction book will include 82 pages based on original art and 18 from flats. I could go on about all the important Simon and Kirby science fiction that will be in this volume including some surprises. And I probably will in a future post. But for now let me just say that this will be a very important Simon and Kirby volume that no fan will want to miss. It is sad that Joe will not see the published results for either of these two volumes of the Simon and Kirby Library. 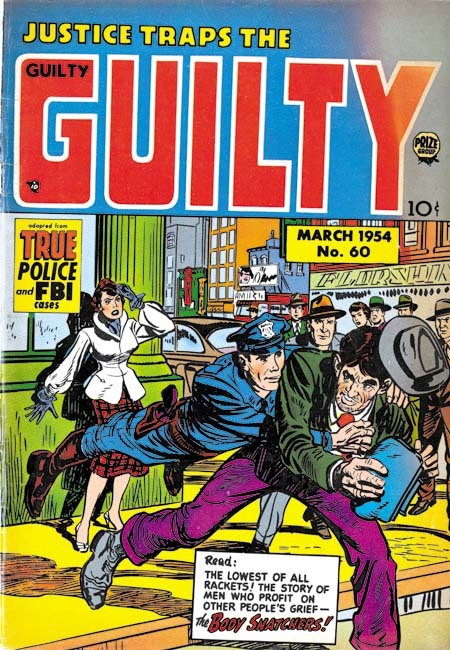 But it is great that the Simon and Kirby legacy will continued to be published by Titan. 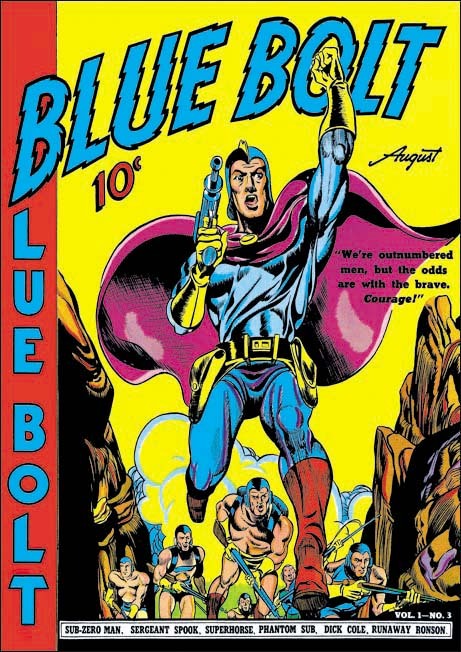 The books being published by Titan are the only ones authorized by the estates of Joe Simon and Jack Kirby.